Pontremoli from Porta Parma. Homes on the Magra River, the Duomo and Campanile, and Il Campanone tower from 1332. If you try to see Pontremoli from your car, you'll pretty much miss the point. You'll want to walk slowly and explore a gracious and welcoming city, a pretty place filled with history and pride and evocative medieval scenes. Use our tourist information to explore one of the the cultural capitals of the Lunigiana area of Tuscany, an important junction on the pilgrim trail Via Francigena, a nexus in the development of Italian publishing, and a good example of the deep roots of the Italian nation. The city was founded at the confluence of the Magra and Verde Rivers, and that's still where the action is. See More Info for a brochure with good maps. Porta Parma in Pontremoli, Tuscany at its best. 1. Walk between the Rivers. Most of the attractions in the old part of Pontremoli are along one main street that starts at the downriver Porta San Francesco at the ruins of the 12th C. Seratti Tower and ends at the upriver Porta Parma gateway. Named Via Cavour in Imoborgo (lower town) the street passes through the center of town as Via Ricci Armani and ends as Via Garibaldi in Sommoborgo (upper town). As you begin, stop at the views from the ancient bridge, Ponte San Francesco di Sotto, and then set off to see most of the historic center, and get a variety of pretty scenes. Along the way, you’ll pass many dozens of palazzi with understated nobility; you'll see intriguing narrow side streets; the Piazza della Repubblica and the tower called Il Campanone from 1332; the Duomo and the Piazza del Duomo with the neoclassical Palazzo Vescovile and Diocesan Museum. Just as important, you'll see the telltale charms of a small provincial city where passersby will smile, shopkeepers make cute window displays, where old buildings have embellishments, where some stores have been vacant for decades, where the cops say 'Buon Giorno' first, where a restaurant doesn't serve coffee, where there's almost no graffiti, where everything is made of grey stone, and where there are used book boxes along the street using the honor system. 2. Visit the Stele Museum and the Piagnaro. The Castello del Piagnaro dominates the town from its hill near the main piazze. It was built to control access to several important passes over the Apennines, and now it controls the icons of Lunigiana - the stele statues. 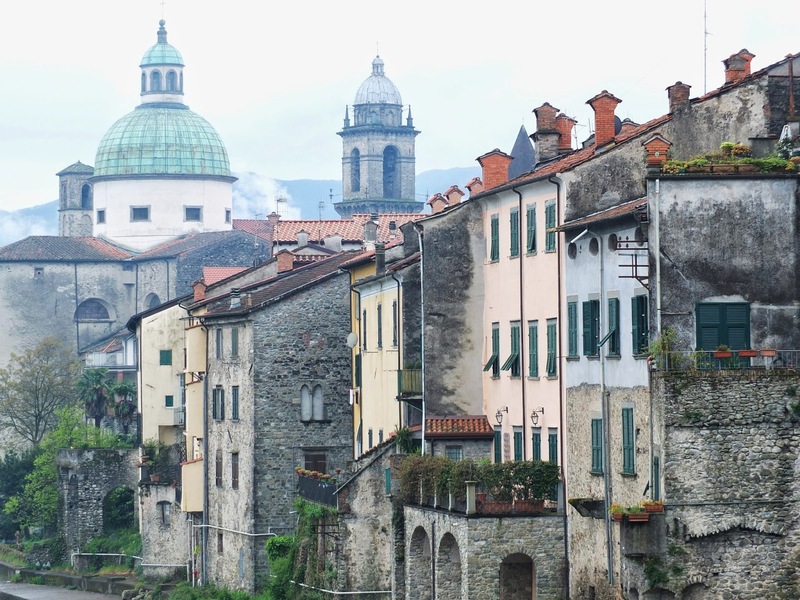 To reach the castle you must climb up, true, but it's through the evocative Piagnaro neighborhood, the original center of Pontremoli. This jumble of stone buildings and narrow surchetti (lanes) suggests a photo at every turn. It doesn't matter which lane you take, just go up already - the views from the castle will make the climb worthwhile. Most of the castle is now the Museum of the Stele Statues. 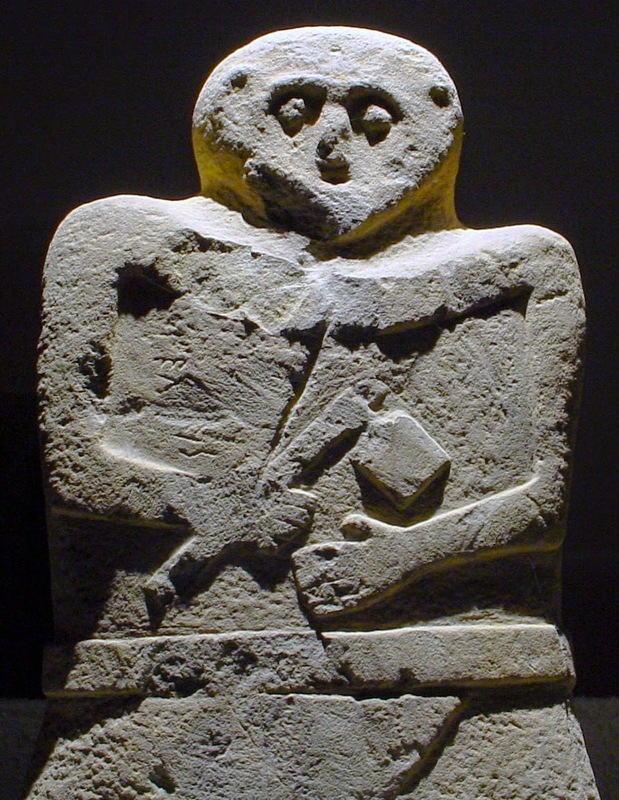 Stele are the indigenous stone statues of Lunigiana- the oldest date back 5,000 years and are evidence of a prehistoric people who fashioned the hard local sandstone into mysterious warriors and figures with feminine traits. The characteristic arched-top sculptures, carved with rough facial features, are the symbol of Lunigiana. No one knows whether the meanings of the stele were religious or territorial or social or all of the above. The Museum intrigues the visitor with the origin question, factually and visually, and adds cultural ambiance to this rocky inheritance. It's a fascinating visit, and English speakers will benefit from renting the audio guide. In them, we recommend the car hire broker Auto Europe where you can compare companies, reserve with a low price guarantee, purchase no deductible insurance, cancel easily, and have 24/7 customer service before and after the car hire. If you will rent a car and want to do us a favor, please use this link: Auto Europe. Presepi (creches) made with bark. Pontremoli Antiques & Craft Market. 3. Visit the open markets centered around the central Piazza della Repubblica. There are tents and booths with varying offerings depending on the day. On the 3rd Sunday of the month, it's the antiques and craft market with offerings that range from farm implements to old furniture to crocheted baby clothes. On every Wednesday it's the traditional weekly street market. On Wednesday and Saturday in season, it's the interesting Mercato Agricolo, or Farmer's Market. 4. Shop for food specialties - this region is filled with unusual and very local ingredients. The mountains are famous for porcini mushrooms and you'll find whatever quality and quantity you like- not just in the fall, but the whole year. At the "local specialties" store at 26 Via Garibaldi near the Piazza Duomo, there are pretty packages of dried porcini that make great gifts. They also have bins of mushrooms - both the large, elegant, but expensive whole slices and the useful and equally tasty smaller pieces. You can buy by the etto (100g. ), or just ask for a pugno, a fistful. P.S. it's not an oxymoron: 'fresh' dried mushrooms are better! Prodotti Tipici means local specialties, such as Porcini. This is Italy, after all, and they're important, so here's a quick sketch of the most significant, the oldest, and the cutest. Much more is available in Italian at Pontremoli Churches on the excellent website Terre di Lunigiana. The Duomo is the most significant, and built from 1636 to 1687, but the facade is from 1879. The interior of our fav, the Tempietto of Sant' Ilario. It is named Santa Maria del Popolo in gratitude for ending the plague in the early 1600's. Inside, the Duomo is bright and open in a Baroque Light style with gilded stucco. Don't miss the frescos on the ceiling vaults or the 14th century olive wood statue of Madonna & Bambino which is carried through Pontremoli's streets every July 2. San Nicolo, on Via Garibaldi after you leave the business area, is the oldest parish church in town. First mentioned in 1126, it was rebuilt in 1664. The outside is not so churchy, but inside is the solemn beauty one hopes for. Notable artworks are the 16th Century wooden sculptures of the Black Christ and a Madonna del Carmine. The bronze doors are from 1966 - when the memory of the recent war resulted in a stylized war scene in a lower panel. The cutest church is definitely Sant'Ilario, just down from Castel Piagnaro toward the west. It's in a neoclassical style and small and crowded with stucco and paintings. It dates from only 1880. It is usually closed, but you can peek in the window. 6. Coffee and Pastry. Stop for coffee and a pastry at Cafè deli Svizzeri and Antica Pasticceria dei Svizzeri. Their special Swiss pastry Amor and the local Spongata have been a big hit in town for (only) the last 172 years. The Liberty Style interior (Italian art nouveau) celebrates Italian cabinetry of the late 19th century, while its quirky decoration contrasts with a sense of humor. There's usually a group of long haired locals talking together earnestly. Only you can decide if more gifts will fit in your baggage. 7. Walk the Bridges While they say Pontremoli means 'trembling bridge', no one seems terribly convinced. Today there are five non-shaking bridges around the old town and they provide good views of the town, the rivers, the passersby, and the valley. The bridges are part of the town's fabric and they escaped major damage in the floods of 2011, but just barely. 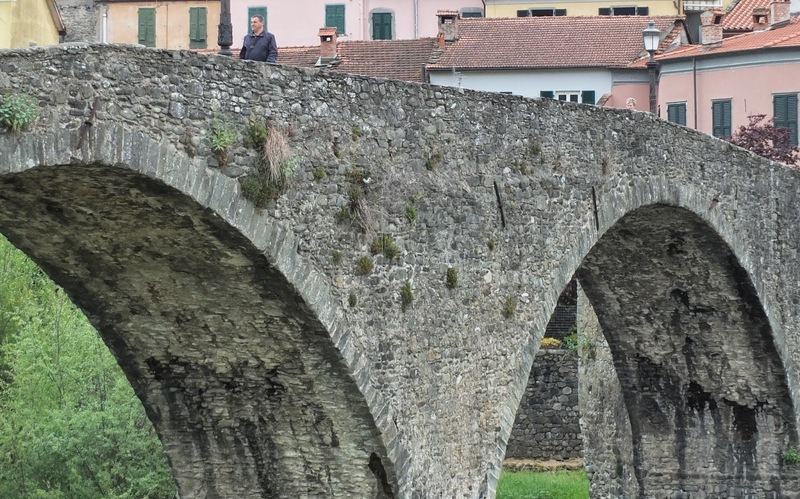 See a video of its bridges under siege: Alluvione 2011 Pontremoli. The pedestrian downriver bridge, the 14th C. Ponte San Francesco di Sotto at the end of Via Cavour, is mossy and medieval looking (because it is!). It overlooks a nice park and the confluence of the Magra and Verde Rivers. Halfway along Cavour, a side street leads to the Ponte del Giubileo which provides scenes up and down the Magra and of the Teatro della Rosa which for some reason is golden yellow. 14th Century Ponte della Cresa, Pontremoli. The intersection at the top of Via Cavour is called Quattro Strade (four streets) and a right on Via Cairoli leads to the Bridge of Four Saints (Ponte dei Quattro Santi) which has, indeed, the statues of four saints. One is St. Geminiano, the patron of Pontremoli, holding the town symbol, representing the Tower of Seretti and the San Francisco bridge. Behind him is a nice view of the town skyline. Lastly, be sure to see the best. The Ponte della Cresa is a 14th C. pedestrian bridge which crosses the Verde from the center of town. It is reached through twisting medieval lanes from an arch near the store (see photo) at 26 Via Garibaldi. It's simply a treat to see the townfolk walking with purpose or with dreams across an ancient landmark with the castle as a backdrop. 8.Restaurants and Specialties. Pontremoli is lucky enough to have several nice restaurants, two of which are listed by the Slow Food Association. Trattoria Da Pelliccia is one of the Slow Food winners, and is right on the main pedestrian drag -Via Garibaldi, uphill from the town piazzas. They're on our list for the next trip to Pontremoli, and their recent menu featured the lamb of Zeri, a local specialty. Della Bietola is a cozy and really charming restaurant with some good local dishes that we reviewed in Italian Sunday Lunch in a Small City , and you'll see how much we liked it. And Trattoria Da Busse is an institution, another Slow Food participant that's been serving locals for the last 80 years. If you're going to try testaroli, this would be a good place to do it! It's appropriately idiosyncratic, serving lunch only with a menu that changes often, and a few house rules: they don't serve mushrooms, and they don't serve coffee. 9. Excursion to an Alpeggio. An alpeggio is a summer village at high altitude where people lived while their herds of sheep or cattle grazed the alpine meadows. The village of Formentara is from before 1508 and it's fairly well preserved. Reached by a curvy and scenic drive from Pontremoli to Zeri and a short hike, it is definitely picnic friendly. Read all about it: A Summer Place in Tuscany - 1508. Old Pontremoli postcard with the Castle Piagnaro and Porta Parma. Take the Pontremoli exit on the A15 autostrada, Parma - La Spezia. The route to Pontremoli centro is well signed, and parking is easy by Italian standards, especially on the west side of town. Pontremoli has an excellent brochure in Italian, Benvenuto A Pontremoli. Even if you don't parlare bene, you'll want it for the maps, pictures, and ideas. You can download here: Benvenuto A Pontremoli. The local guide Francesco Bola specializes in Lunigiana and is highly recommended. The website is primarily Italian but he guides in English as well. Turismo in Lunigiana. Ciao Lunigiana is a unique and trusted source for local news and information for native Lunigiani, ex-pats, and visitors.